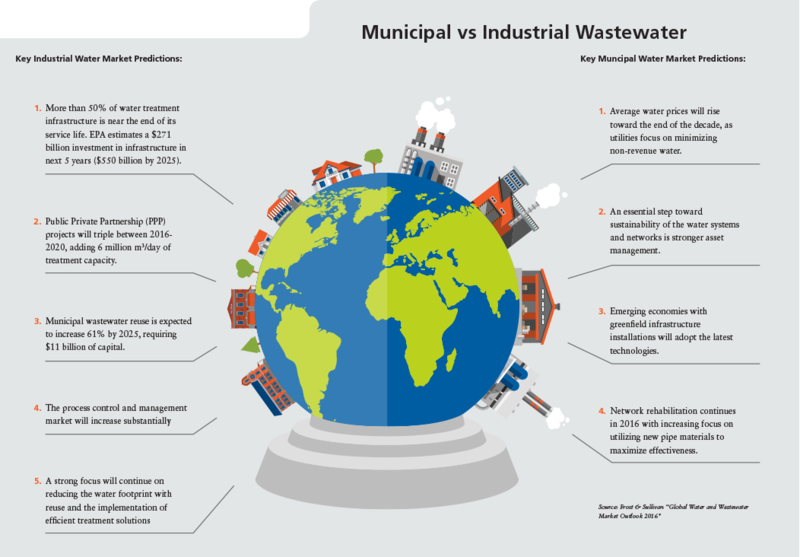 U.S. Municipal Wastewater: Where are we headed? 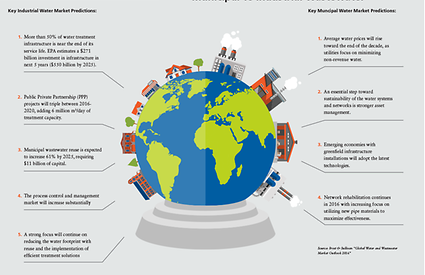 Municipal wastewater reuse will increase by 61% by 2025, requiring $11 billion of capital, according to a 2015 report by Bluefield Research. With more than 247 reuse projects currently in various stages of planning in the U.S., this is a key market trend. Despite being enormously expensive and using significant energy resources, desalination will also continue to be a part of the water treatment conversation with roughly $21.4 billion spent on this technology in 2015—an investment that is expected to reach $48.2 billion by 2020. Disinfection, filtration, and desalination are expected to grow in Asia-Pacific. Australia, China, and India with high investments in the desalination process. As consumers seek convenience and cleanliness in a quick-and-easy “disposable society,” more people are using wipes today than ever before. Flushable and personal care wipes have seen consistent growth worldwide over the past decade with no signs of a slowdown. More than 50% of U.S. Muni water/wastewater infrastructure is nearing the end of its useful life. EPA Survey: $271 billion investment required to improve infrastructure over next 5 years. Muni water reuse to increase 61% by 2025 requiring $11 billion in capital. $550 billion to be invested between 2016 and 2025 for capital improvements to replace deteriorating pipes, sewer overflows, etc.